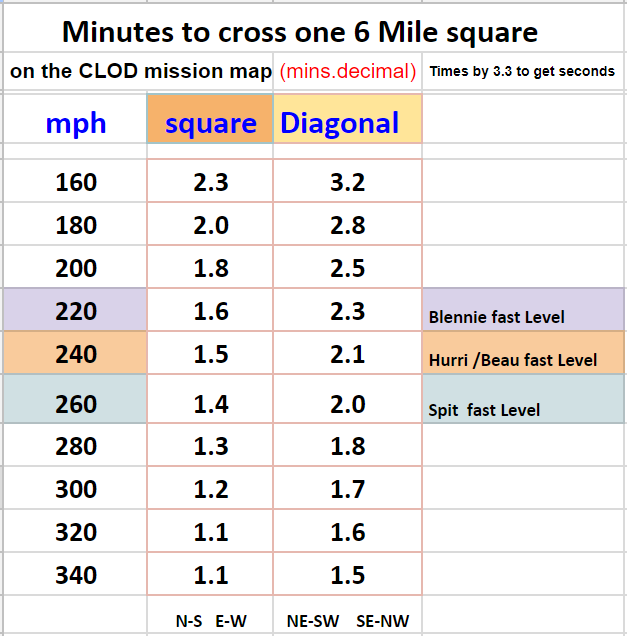 For those who wish to add bombing insults to the Hun's 303 injuries, here is a grid times/speed table which much improves the odds of arriving across the channel where you want to be. I have tested the numbers in ACG public server and they work. And it is easy ..ish. Our map grids are 6 x 6 miles . I checked. Load a Blennie and try it out! As you can see from the historical declination maps (if you looked!) in our patch of southern England in 1940 it was 11 degrees to the West of True north. (In Kent it was 10 degrees, in Penzance it was 12 degrees). In 2016 it reduced to about 2 deg, and in 2050, it will be pretty much the same as true north in the Slightly United Kingdom, so you can forget all this malarkey. Outstanding work on this Skewer. I ESPECIALLY like the part about getting my plane cleaned up. This was a lot of work and I hope it becomes helpful knowledge to those trying their hands at bombing. Thanks for taking the time to post this! I think Recon has been doing quite a bit of it, so he should be paying close attention.